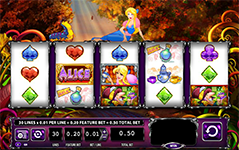 Follow Alice down the rabbit hole in the exciting 5-reel 30-payline video slot based in the Wonderland known from the popular story. This game has 7 bonus features with 5 triggered at random, with the Alice Feature giving you up to 5 Wild reels. 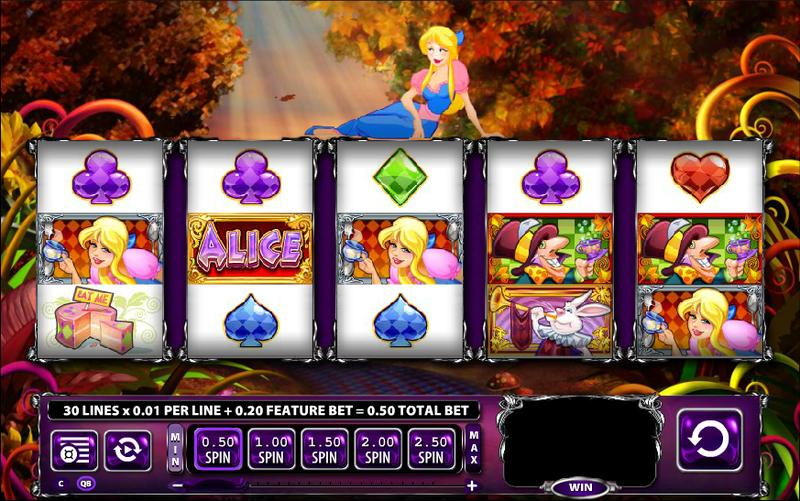 Based on the classical tale of Alice in Wonderland, this slot will help you relive your childhood. The icons and slot background look straight out of a storybook while the features and wins will make you feel a part of Wonderland itself. 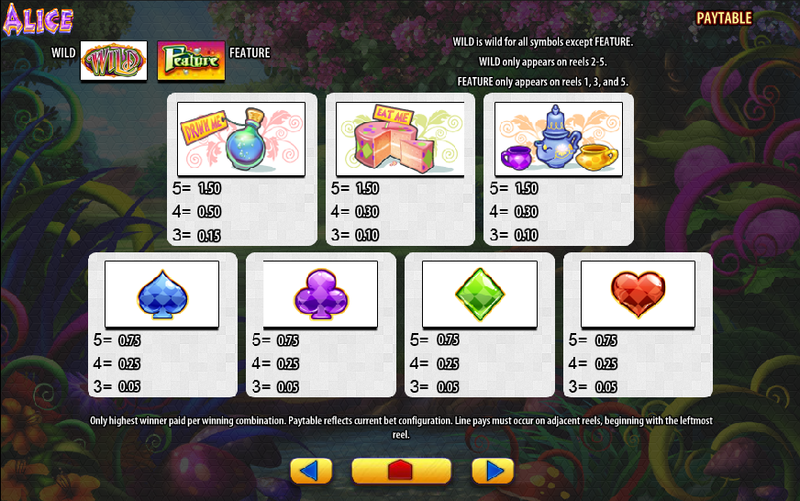 The Mad Hatter feature is triggered when The Mad Hatter appears after a spins that does not award another feature. This is a pick-me bonus, and you will be asked to pick between a series of tea cups to reveal rabbits, cupcakes, or diamonds. 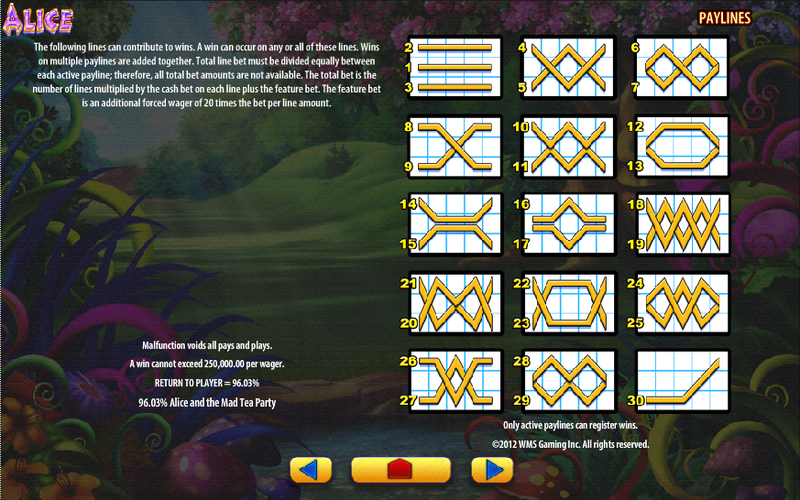 Accumulating cupcakes increases the multiplier to 3X, 5X, or 10X. The diamonds will award a 1X or 2X the total bet. 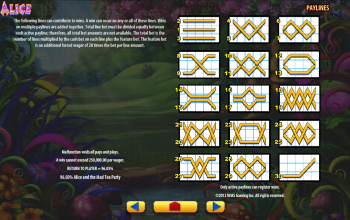 The rabbit will award you 10X the total bet. 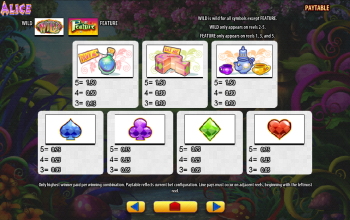 Other features include the Super Mad Re-spin Feature, the Mad Tea Party Free Spin Feature (6 free spins are awarded), the Alice Feature, the Cheshire Cat Feature, the Queen Feature, and the Caterpillar Feature. 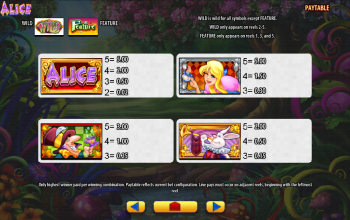 Play the game today to experience all the magic that lies behind the reels of Alice and the Mad Tea Party slot game.